We’ve compiled a list of the best work boots for plantar fasciitis; based on their comfort features, durability, affordability, and customer opinion. When you have plantar fasciitis, you can often feel pain and discomfort in your feet. It is essential to have the right footwear that supports your feet and alleviates your pain. But when it comes to work boots that you need to be in all day, that can be easier said than done. This doesn’t look like your traditional work boot and it’s great for both on and off the construction-site. The Irish Setter boot is known for being extremely-tough and durable, with underfoot comfort and easily-broken-in leather. 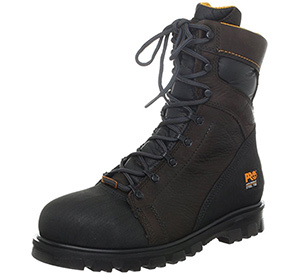 This is one of the best work boots for plantar fasciitis if you need to do a job and look-good doing it. 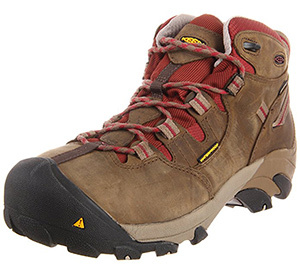 KEEN is known for their durable and functional footwear. This pair of women’s work boots is no exception, with a ton of practicality and comfort thrown into the design. Both the sole and cushioning is designed to hug and support the natural contours of your feet; alleviating pressure and pain. The Detroit boot is great on the job-site, out in the yard, or out on a hike. Caterpillar makes great products for the hard-working person. These boots are designed to be tough in all environments, with extra lining, padding, and insulation. Not just designed for comfort, the Diagnostic work boot is built to last and keep your feet safe on any job. 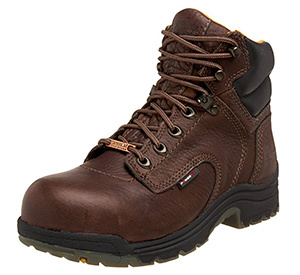 One look at the plush collar of these boots and you’ll see why these made the best work boots for plantar fasciitis list. Wolverine added feature after feature to ensure your feet are stable and supported throughout the day. The Durashock outsole helps absorb up to four-times the amount of shock as your typical work-boot. 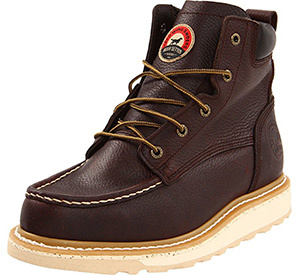 It should be no surprise to you that Timberland’s boots are featured twice on this list. The Titan boots are some of the best work boots for plantar fasciitis; providing comfort and durability for as many hours as you need. 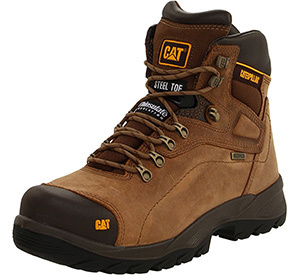 These boots provide all the comfort your feet need, as well as the stability and construction to protect your feet at any job. 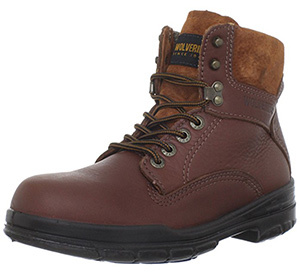 Rounding out the top of the list is this beautiful pair of work boots. They are designed for long days at work, with features created to make your day easier. The ladder-lock and extra-treaded sole ensure stability, while the contoured, density foam works to keep your feet from feeling fatigued. From durable construction to maximum comfort, these boots do it all. Your plantar fasciitis doesn’t have to ruin your workday. The best work boots for plantar fasciitis you’ve seen on this list will provide you with the perfect blend of comfort and stability to keep your feet moving for hours. Which work boot works the best for you?